You are here: Home / Beekeeping / Swarming of Honey bees – Everything you must know! In nature the bees regulate swarming themselves. The time of swarming depends in what state the bees come through the winter. If the hive contains enough bees they are very likely to swarm earlier than a small hive. The hive needs to get stronger. After the hive regained its strength it is ready to ’swarm’. Swarming is important for bees, because it is their way of ensuring for offspring. In this article I will describe the process of natural swarming. some beekeepers really believe in natural swarming and other beekeepers hate it. I live in a densely populated area so swarming is for me not preferred because of the nuisance it can cause. What I do is artificial swarm making but this will be discussed another time. Sometimes in the hive there is a real push to start swarming. Bees start to build queen cups, were potential new queen are being born. The bees are really desperate to start swarming and this behaviour is known as so called ‘Swarm Fever’ under beekeepers. As a beekeeper it is difficult to reduce the swarm fever, but understanding swarming can help the beekeeper to intervene at the right moment. Swarming can be triggered by different occurances. 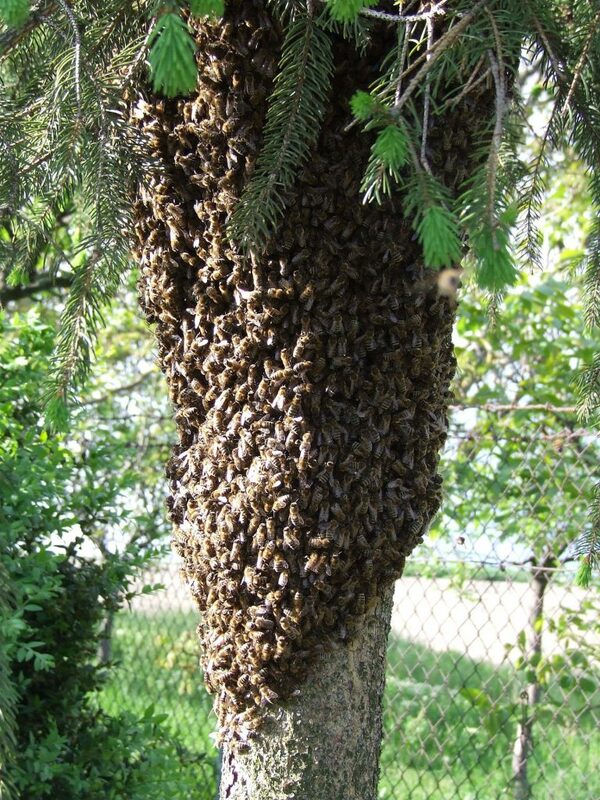 Seasonal: when spring arrives bees prepare themselves to start swarming, this is is a natural occurrence. The time can differ, the hive needs to be strong enough. Less queen bee pheromone: When a beehive gets too big the queen pheromone gets reduced and does not spread entirely through the hive. This can be a trigger for the bees to start swarming. Space: Sometimes the honeyflow in nature is abudant for just a few days. All the bees start flying out and bring nectar into the hive. They process it to the other bees, which put it in dormant cells. This can also be into the section of the hive where the eggs are laid. If there is not enough space this can be a trigger for the bees to prepare to swarm. The beekeeper should make sure that the hive has enough space for the bees to grow sufficiently. Genetic: In some queens the swarm behaviour is really strong. We had once a hive which swarmed 3 times in a year and we really tried to prevent it. A solution to this can be bringing in a other queen from a different hive with different genetics. The triggers can only occur when there are several prerequisites met. Bees which are leaving the hive prepare the household to start moving. The bees take care that there is enough honey and pollen to survive for the remaining bees. egg production is reduced the bees start to ‘starve’ the queen. A few days in advance of swarming the queen is put on a diet to prepare her for the upcoming journey. This also means fewer eggs will be laid. and fewer larvae need to be fed. To avoid pollen rot, the bees put a small layer of honey over the cells. The honey dries which ensures the pollen are preserved well. This can also be a valuable sign for the beekeeper. It can see the bees are preparing to swarm, if he don’t want to loose his bees he can take measurements against it. Mature drones in the hives are also very important for the next offspring. It is important the beekeeper does not cut away all the drone comb in the hive. You obviously need drones for new healthy queens. The worker bees build queen cups from early spring, these cups are normally located on the bottom of the honey comb. As a starting beekeeper you don’t have to be scared the hive will start swarming right away. Sometimes other bees will break down the queen cups other workerbees have build witing a few hours. When the queen bee lays a egg in the cup the bees will nurture the egg to a new queen. It is common the queen bee lays eggs in multiple queen cups. The eggs are not laid on one day, it is normally to spread laying over several days. Which means each day a separate queen can be born. This laying stops when the original queen leaves the hive. This is normally after 9 days after the oldest queen cell (first queen cell where the queen laid her egg) is closed. After all the preparations the hive is at some point ready to swarm. Swarming looks very chaotic, half of the bees are leaving the hive and start flying around. The bees consists of all ages and the bees themselves know who should stay and whom should leave. You could image if a hive consist of 35.000 bees half of them fly outside of the hive, this is a very imposing happening. The queen is one of the last ones who leave the hive and starts flying. When the queen lands on a branch all the other bees will join her. Normally the place where the queen lands is located only a few meters from the hive. On the queen landing site the bees form a cluster. To remember: The swarm with the old queen is normally called a prime swarm. This type of swarm normally start swarming around noon (11.00 – 14.00). This type of swarm normally does not fly far when they form a swarming cluster. This is within 15 meters of the hive, often the queen lands on a common object around the hive. for example a tree branch, a fence pole etc. Prime swarms are bigger than After swarms. The most experienced bees who normally forage for food. Start scouting the area for a new possible nesting ground. The scouting bees return to the cluster and start communicating about their findings. Scout bees communicate through a dance which is similar to the flower dance. More bees are flying to the possible new nesting site. Also they return to the cluster and start dancing. If enough bees conclude the site is right the swarm will start flying. The agreement to go, can sometimes be seen as the whole cluster is dancing. The cluster rises to the sky and start the journey to their new home, the whole swarm can be several meters wide during the flight. The queen is the most precious part and she deterimes the speed, the swarm is guided by the scouting bees. The journey can take up to a few kilometers and can take upto several days. It is common for the bees to stop several times on the way it the distance is to great for the queen to fly. Sometimes it occurs the new location does not meet the standard of the hive and the whole process of scouting process start over again. The prime swarm starts after the first queen cup is closed. The already propogated queen bee starts her journey to a new location. After a few days the first queencup starts with toothing and soon after the first queen emerges will result in quacking. The queen bees will challenge each other and one queen bee will remain. Because the queen bee has laid eggs in multiple queen cups several days apart. When these queen bees start hatching they will not do the ‘toothing and quaking’, because the royal slaughter has already take place. The newly hatched queen will swarm straight away and the whole swarming process starts again. When the hive swarms again, the beekeeper will again lose half of your bees. E.g. when there were first 20.000 bees available in the hive ,now only 5000 are left after the first after swarm. And this process can continue several times in case there are multiple queen cups in the hive. It is common to merge the after swarms with each other if they are too small. What can be beneficial of a prime swarm is they do not swarm the rest of the year, and they also limit the amount of drone brood in the hive. A disadvantage is they swarm farther and higher, so catching them is harder. Bees have the tendency to look far away from the hive for a new place. Because I do not have my bees at my home place, I place a decoy hive in my garden. Near my home I have several other beekeepers. And it is always possible one of their hives swarms. So for that reason I will prepare a decoy hive, maybe this result in free bees and who doesn’t like free bees. The modern beekeeper often want to avoid the swarming of thier hive. Because first it will reduce the bee amount significantly and second it can be unpleasant for the surrounding neighbours. The decoy hive then serves a dual purpose. I prepare the decoy hive in early spring, just before swarming season. The hive consist of a bottom, brood box and a top. Inside the hive I normally put one bee frame with old wax in the hive, old comb works as a attractant for swarms. The remaining 9 frames I leave empty with a small piece of comb at the top for easy building. When bees swarm it is common the scouting bees start looking several days in advance for a new hive. Once I noticed a lot of activity around the decoy hive. I was sure bees where started to occupy the decoy hive soon. All of a sudden the bee activity stopped. What was the case the neighbouring beekeeper was glad to tell he had a new hive from a very large swarm. Among beekeepers there is a unwritten rule that if a swarm comes loose of the hive. It is no more the property of the beekeeper. The bees are leaving the hive and if the bees occupy a decoyhive the beekeeper does not lose it’s bees. But normally a swarm which leaves the main location of the beekeeper and flies off to somewhere else it becomes nobodies property. Until the swarm is catched by another beekeeper, then the bees have a new owner. Please be aware swarming is not always favoured in some densily populated areas. It is the beekeeper’s responsibility to maintain his hive in good condition and he should try to avoid (multiple) swarm(s).